Since I have started along the path to minimalism and a simpler life, I have read everything that I could get my hands on about simplifying, decluttering, and organizing. Almost every book and blog that I have come across features a before story and an after story, as in “before we couldn’t get the front door open and had to climb through the window” and “now, after, we can play tennis in our living room”. 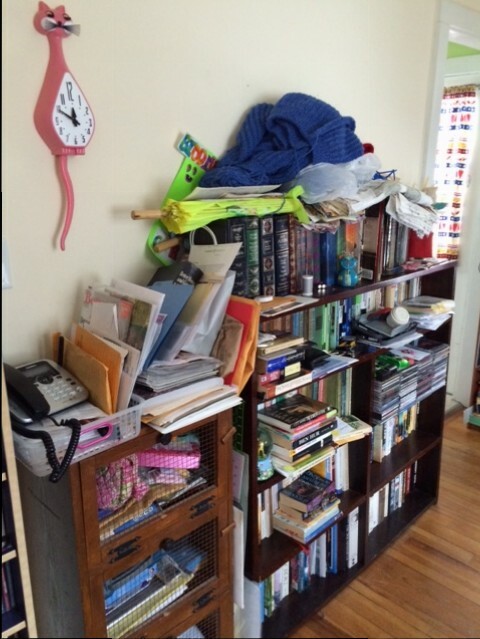 A few of these books and blogs describe the process used to clear and declutter, and even the amount of stuff removed from their spaces. And most are excellent and inspiring sources. But there is a scarcity of the during. I haven’t found a source that said, “Here is my mess today and here is my plan to deal with it. Now here is what I did, here is how I got rid of the stuff, and here is the after.” That is what I would like to accomplish with this blog. I want readers to be able to see the unpolished, horrifying before, the messy, arduous during, and the shining, beautiful after. 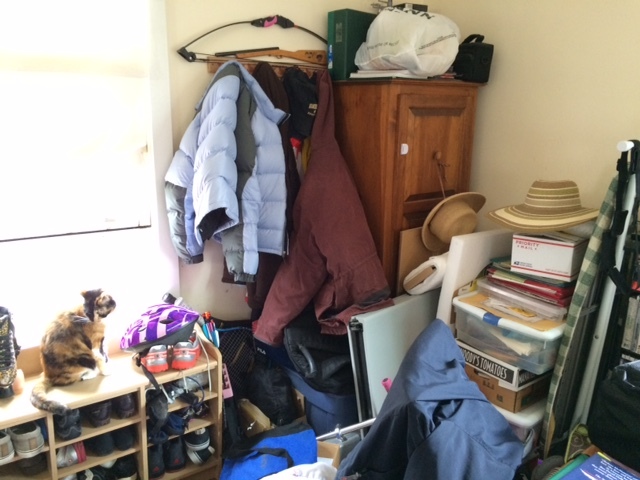 At each step, I will explain my plan to tackle the clutter, and then show how I went through it, and disposed of it. Hopefully, documenting each step of the process in microscopic detail will help others see that they can simplify and declutter as well. Readers can look at my pictures, my methods, and my results, and think, “If she can clear up that mess and make it look that good, why, I can do it too!”. So without further ado, allow me to introduce you to this month’s project: The Dining Room! For some reason, our dining room is the catch-all area of our house. It is so piled with STUFF that we can’t actually use it as a dining room. It acts as a mail collection center, library book dumping ground, sewing area, ongoing project area, file-and-paper deposit area, and laundry staging area, among other things. What it doesn’t act as is a dining room. 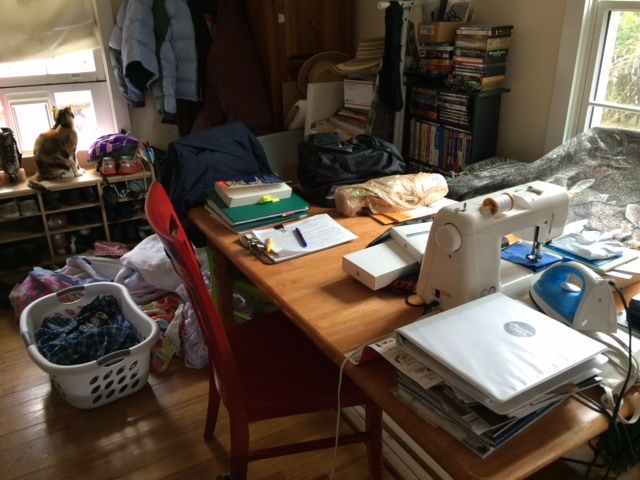 Here is the dining room table, piled with books and mail, as well as our laptop computer and the sewing machine. 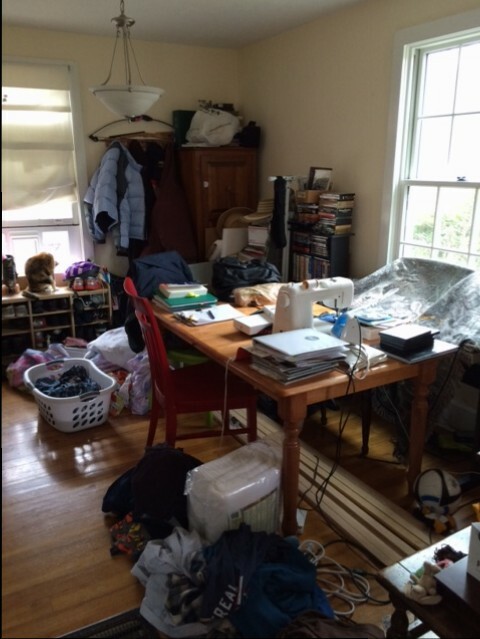 The sewing machine is on the dining room table, because it doesn’t fit in the sewing room. The laptop is there because the desk is covered with its own pile of stuff. Here is the large bookcase. It holds books nicely, and also provides a horizontal surface for anything that we don’t want our cats to bother (sewing projects, school projects, etc.) Notice how we have CDs piled there as well, in front of the books. 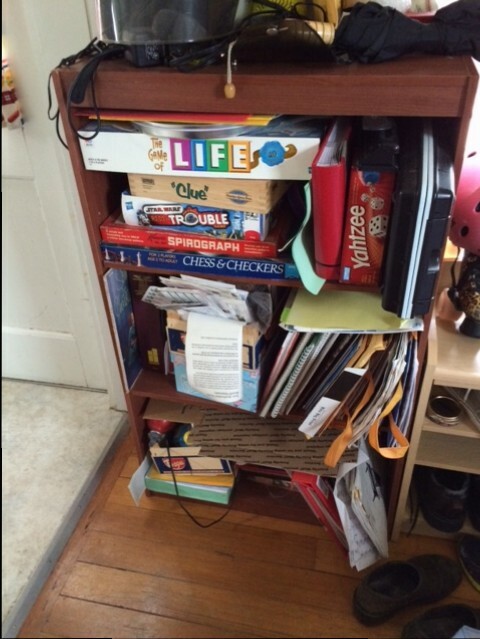 The small bookcase was put there “temporarily”, eight years ago, to hold games and school work. It blocks the door to the kitchen slightly as well. 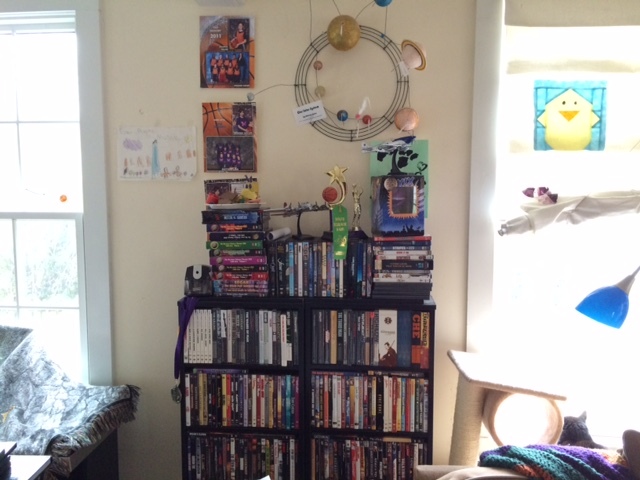 The DVD shelf has a lot of DVDs on it, in it, and on top of it. More than we need, in my opinion. And then there is this corner. We can’t open the blanket chest in the corner because of all the stuff piled in front of it. We can’t get to our coats without tripping over shoes and junk. I hate this corner. It is just a huge pile of junk, and looks horrible. AND when you walk through the front door, it is in your direct eye-line. I want to move all the coats and shoes into the closet under our stairs, but we have to rip out all the drywall in the closet and replace it. The drywall was damaged when our old water heater sprung a leak. We can’t tackle this project until the weather warms up, as we will have to remove the water heater. It’s currently slated for late May – early June. We plan to rip out the drywall, install some insulation along the outer wall, put in new drywall, paint, and install a shelf and hanging rod. The laptop computer and its accessories need to go on the desk. However, our old desktop computer is on the desk. I need to clean all the files off of the computer and move them to the new laptop before we can decommission the old computer. I use the table for sewing and quilting because it is the only space large enough to accommodate working on a quilt. I did have the third bedroom set up at one time for quilting, but now it’s full of junk. Here is the desk and the soon-to-be coat closet. As you can see, we did not rehang the door after installing the water heater. It has just been sitting there for a year. All the junk in the floor are things that are being sold or donated. Our house is like one of those sliding puzzles. You have to move this piece before you can move that piece and then move the first one back, and so on. 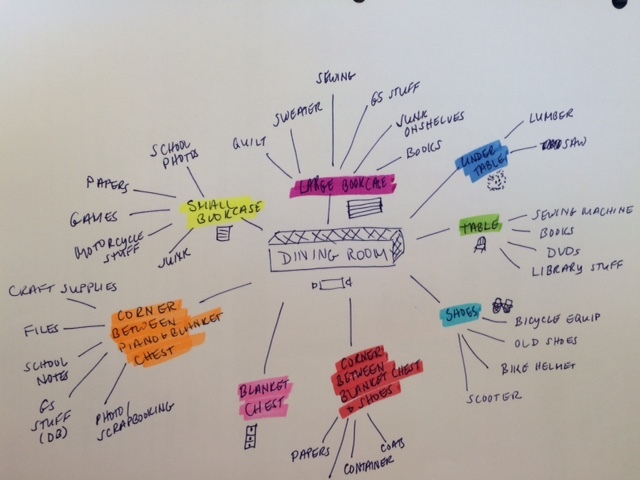 To deal with this project, the first thing that I did was make a mind-map of the dining room and its issues. I used the mind-map to break the area down into more manageable sections. I then identified the primary issues in each section. By focusing on one section at a time, I am hoping to avoid that overwhelmed feeling that I get every time I look at our dining room. 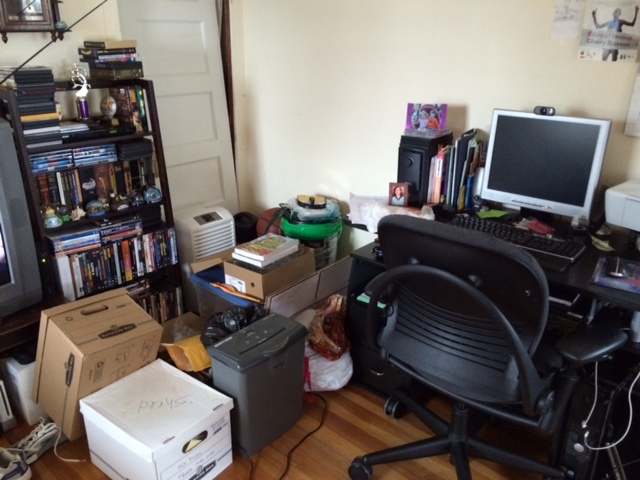 Over the next few weeks, I will be documenting this decluttering project as I tackle each area. I am hoping to see some positive difference by the end of the month, and have the entire space cleared by the end of April. I hope that you will follow along, if for no other reason than to pride yourself on how your house is not a giant mess like mine. I really really appreciate your posts. You remind me of my blessings.